But what about the rest of us? Not to get too new-agey on you, but people are more than just mind and body. Is it possible gaming can have a positive impact on your spirit, personal motivation, and world views too? Well, it certainly depends on what you’re playing, but, according to a handful of forward-looking scientific studies, the answer is yes. As more and more people who grew up playing video games enter adulthood, more and more studies are focusing on the potential benefits of gaming, instead of just the negatives. The result is a far more balanced view of gaming from a scientific perspective, and a lot of it looks pretty darn good. So, the next time you feel like you need an excuse to crash on the couch or behind your PC for a few hours of gaming, here are some really good ones. Video games are fun. Sort of obvious, right? Who would dedicate so much time to them if they were a drag to play? The thing about fun, though, is it isn’t just a drain on time. Fun actually generates positive emotions, which helps to negate negative emotions, thereby making us happier overall. And what difference does it make whether you feel happy or not? Quite a lot, according to research. In a roundup of happiness studies, researchers found that happier people lead better lives. They are physically and mentally healthier, have fuller relationships, and achieve greater financial success. Well, of course they do, you might think. If you’re healthy, have good relationships, and have money, you’re bound to be a happier person. But researchers took that reverse-correlation into account, determining definitively that the positive outcomes didn’t cause people’s happiness, it was the happiness that caused the positive outcomes. Basically, playing video games (specifically quick, easy games with consistent rules, like Candy Crush and Angry Birds) makes you happy, and happiness matters. Those same quick, simple games that make you happier? One way they help to do that is by decreasing your anxiety levels. And not just the everyday sort of anxiety most people experience, but the oppressive, ongoing kind of anxiety that leads to diagnosis and drug therapy for many. In a study done at East Carolina University, researchers found that supplementing the primary medical treatment (a serotonin reuptake inhibitor) of clinically depressed study participants with casual video games, including Bejeweled 2 and Bookworm Adventures, lowered anxiety levels of those participants 20% more effectively than taking a secondary medication. If that’s not a good enough reason to pick up a controller or smart phone before calling your doctor, I don’t know what is. If playing video games reduces anxiety, it goes to reason it should also reduce stress levels, and, according to a study of 66 American employees, as reported by Science Daily, that’s exactly what it does. The study, in which participants took five-minute breaks from a task that was designed to simulate the mental fatigue produced by work, measured the effects of three different rest activities on participants’ moods. The first activity, a silent, actionless break, left participants’ minds unoccupied, which, in turn, caused them to worry about work. The second activity, a guided relaxation activity, did produce some reduction in stress. But it was only the participants who played a simple puzzle game, Sushi Cat, who claimed to actually feel better after their breaks. So, the next time you get caught sneaking in a game of Minesweeper at work, tell the boss you aren’t slacking, you’re just recharging your mental processors. And if you’re wondering if only simple, non-violent video games provide relief from stress, according to Dr. Christopher J. Ferguson of Texas A&M the answer is no. Ferguson’s study found that violent video games provide similar stress release, but, perhaps, for a different reason. Ferguson suggests violent video games may allow players to work through their real-life frustrations in a fictional format. 4. Gaming helps fight depression. Let’s see, increase in happiness, decrease in anxiety, stress relief, could it be gaming is just an overall heavy-duty depression-fighting cocktail? Well, yes, yes it is. If you ask the right people. As pinpointed by scientists, and perfectly summarized by researcher Jane McGonigal, Ph.D. in this 2015 Slate article, gaming hyperstimulates two regions of the brain, the reward center, associated with goal-setting and motivation, and the hippocampus, associated with memory and learning. These are the same two areas of the brain that are “chronically understimulated,” according to McGonigal, and can actually shrink in someone suffering from clinical depression. 5. Gaming makes you more resilient. Because her mind-blowing insights can’t be relegated to just a single number, Jane McGonigal is back at number 5 with this article in the Harvard Business Review to let us know those mind-blowing effects gaming has on depression aren’t just temporary. Playing video games is one of those casual uses of time that can have positive long-term effects. Apparently, trying to defeat the same boss (or level two in Ghost ‘n Goblins, am I right?) twenty-five times in a row doesn’t just make you a glutton for punishment, it actually makes you more resilient, and that resilience translates to the real world. Evidence suggests regular gamers are simply less likely to give up in the face of real-life difficulties. How badass is that? 6. Gaming can enhance self-esteem. Feeling a little unsure of yourself? Need a boost in confidence? Well, you can always post a selfie and wait for the compliments to roll in (though that works best for people who already have an abundance of self-confidence), or you can take a time out and do some gaming. In a study by researchers at the University of Rochester and Immersyve, Inc, gaming was found to increase self-esteem under certain conditions. The first condition is that gameplay is autonomous, meaning a player is free to play and make decisions as they choose, such as in world-building games like Minecraft. The second, and most important, condition is that players experience “competence need satisfaction,” basically the feeling they have accomplished what they wanted to or played the game well. The increase in self-esteem is immediate (actually occurring while the player is playing), and it may not be a life-changer, but could prove time well-spent right before a job interview, test, or other event that could benefit from a small uptick in confidence levels. 7. Gaming with others makes you more helpful. Do you enjoy multi-player games that require cooperation to accomplish a goal? Chances are, they’ve made you a better person. Or at least a more helpful one. 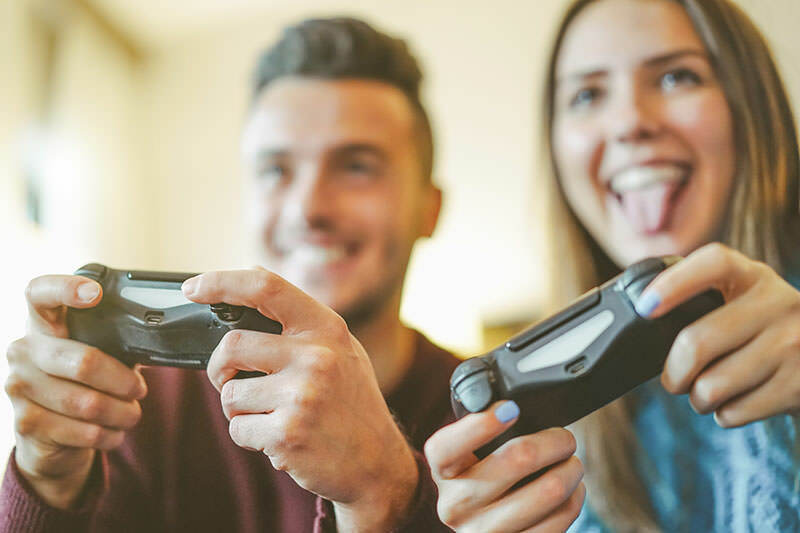 A study conducted at Texas Tech University found people who played video games cooperatively with other players showed more pro-social behaviors after playing than those who played competitively against other players or who played the same games on their own. What’s more, cooperative playing decreased players’ aggression, even when playing violent games, potentially negating the increase in aggression that violent video games can produce in some people. And these pro-social behaviors? They weren’t just directed toward a player’s teammates. Players were also nicer to opposing players without expectation of opposing players being nice to them in return. 8. Gaming might make you a better leader. Could millennials hold an advantage in leadership over previous generations simply because they grew up playing video games? It’s possible, according to researchers who have studied the correlation between gaming and employment skills. At the very least, gamers possess a unique set of attributes, including greater self-confidence and the abilities to multi-task and creatively solve problems. Together, these characteristics are thought to make gamers ideal candidates for the highest levels of leadership. So, those hours a week you spend gaming just because it’s fun can be providing you more than leisure. They can be adding up to legitimate skills that enhance your employability and promotability in the real world. 9. Gaming is a powerful learning tool. People don’t just play games, they also learn from them. Some of the lessons are simple, such as learning to switch up your technique when you fail to clear a level. Some of these lessons, however, especially those taken from world-building games and RPGs, teach higher-level skills and datasets that can be hard to grasp as abstract concepts alone. In a study of community-based, multiplayer games (games in which players inhabit a shared world that is separate from the real world, but often equally complex), researchers found players can learn a lot about city-planning through games in which they build online worlds, or about politics by participating in political campaigns within their gaming communities. It’s a “learn by doing” scenario where the skills one picks up during gameplay can translate into real life capabilities. Corporations, governments, and militaries have already harnessed the power of video games to teach and to train, so the main question the study’s researchers pose is: why aren’t we seeing more video games in other learning environments, such as our schools? 10. Gaming can actually promote a desire to learn. Teaching kids is one thing. Getting them interested enough to learn is a whole different matter. But a joint study by researchers at New York University and the City University of New York found that, not only do video games help students pick up material more readily, they actually make kids want to learn. Specifically, they can give school-age students the desire to practice subjects that are notoriously unpopular, like math. In the study, students were more interested in playing a math-based video game when they played with another student, either competitively or cooperatively, and, when playing alongside another student, they also adopted a mastery goal orientation (or the actual desire to improve their math skills, as opposed to just looking as if they knew what they were doing) that is thought to be crucial to learning. Video games aren’t going to make you a genius. Not on their own. They’re not going to cure your depression, or give you the confidence of a Kardashian. But video games have been shown to have a lot of positive effects in a lot of different areas. If they make you feel better, boost your self-esteem, and help you grasp theorems, play up I say.